I think he looks very much like Michael Middleton, with a bit of William and Diana in the smile. Charlotte looks more like the Windsor and Spencer sides (someone posted a comparison of Charlotte and Diana at similar ages and they look quite similar). I think that Louis looks more Middleton right now, in the photo of him smiling that they released at the christening he looks very much like Kate did as a baby. From the lips down (and the lower half of the face) Charlotte remind me of the Queen. Her eyes remind me of Carole Middleton. The most recent pic of Louis reminds me of George but not the Michael Middleton look...perhaps a blend of Kate and William. Us Weekly has a new dispatch on how Kate Middleton and Prince William's three royal kids are turning out as they grow up and into their personalities. She's also a great little hostess, the source detailed. "She’ll come up to guests and ask them if they want tea or coffee or offer them sweets—so adorable!" Indeed. George and Charlotte's baby brother Prince Louis right now is “very quiet and content, always smiling and happy," the source said. But the potential is there for him to be the most talkative of all when he starts to speak. I love the anecdote about Charlotte offering the guests coffee or sweets at parties. So cute! When my little cousin was about her age and we were at a family gathering, after my aunt asked what everyone wanted to drink, he exclaimed "coffee, please!" which was the cutest thing ever. As Prince William left the @skillforceuk award ceremony in the Great Hall today, we gave him three specially-created colouring books for his children. The sketches were created by volunteer at the @lapworthmuseum Julian Kiely, who joined as part of the Duke of Edinburgh Award! Video of little Louis - in Kate's arms, while William carried the baby bag - just shown on Oz TV. Leaving the helicopter and making their way back to their Kennsington Palace apartment. Apparently they were also filmed boarding the helicopter to fly to Norfolk, following the State Banquet and Louis was spotted then too. Princess Charlotte is twirling her way into the festive season. Read more: Princess Charlotte Is Taking Weekly Ballet Lessons — Just Like Prince George! "I'm Archie" prince George says! Probably after the character “Archie Bunker” because, George, looked like him when he was a baby. I have to admit that Archie Bunker was the first Archie I thought of when I read that. Archie Bunker was the quintessential bigot that everyone used to love to hate and the show really put into the forefront the changing of society's thinking back then in the 70s. I still watch the reruns of that show but is Archie Bunker that well known over the UK today with the younger generation? Its cute though that George has selected his own personal "alias" for himself. This shows me that he's being cautious with strangers he doesn't know. Well, probably not with George’s generation, but I’m sure his parents and grandparents know that character pretty well. When I first saw that picture I posted above, Archie Bunker, was the first person that came to my mind. I think it is much more likely Archie is a children’s book character. I really don’t see Archie Bunker being at all relevant to the Cambridges’ lives. Archie is the name of the main character in the Archie comics. There's also a new show about the comics out--Riverdale. I can see Kate (maybe Will, in secret) watching the show and George hearing Archie from them. I agree with O-H Anglophile: I can't see Archie Bunker being relevant or even known to Kate and Will. Was All In The Family even shown in the U.K.? My first thought was the Archie comic strip. I used to read it when I was a kid. I didn't really think of Archie Bunker until Osipi mentioned him. Yes, the show originated from the UK. I’m just saying, George kinda looked like a little version of, Archie Bunker. The Cambridge’s could be talking about a completely different “Archie.” The kid had the chubbiest face and full of character as a baby. Yes, the American version was based on a British TV show-“Till Death Do Us Part”- but the Carroll O’Connor version-“All in the Family”-was all American. The American version may have been shown in the UK, but I’m not finding any indication of that. The Archie Bunker character’s name in the British TV show was Alf. I found a cute series of children’s books published by Bloomsbury (the UK original publisher of Harry Potter) where the main character is an anthropomorphic dog named Archie. That’s another possibility. Pictures of Prince Louis to celebrate his birthday have been leaked. He has changed a lot. Super cute. He looks like George to me. So cute!!! 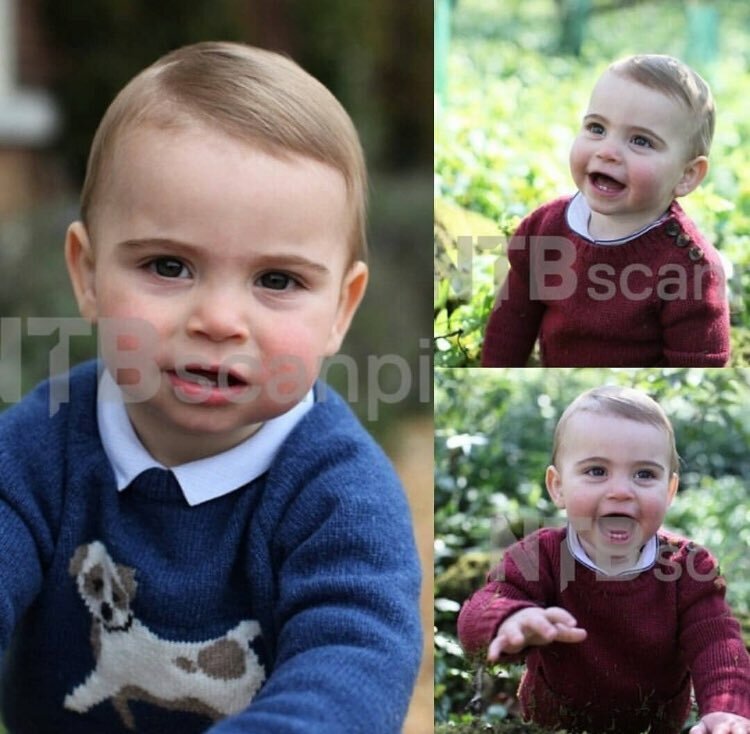 He seems like the perfect mix of George and Charlotte!